Perfect for the increasingly chilly winter nights, this curry is wholesome, hearty and warming. This particular recipe serves 4, so you can invite your new pals over and show off your culinary skills, or pop any leftovers in a tupperware and keep it for another day! For the spice mix, dry roast the whole spices, then ground to powder. Heat the oil in a pan/skillet/pot, then add the onion and cook until softened. Add the garlic, ginger, spice mix & chilli, then stir until combined. Add the diced sweet potatoes, then stir to coat them with the sauce. Once everything is well combined, add the tomato and stock, and then season as required with salt/pepper. Bring to the boil, then lower to a simmer. 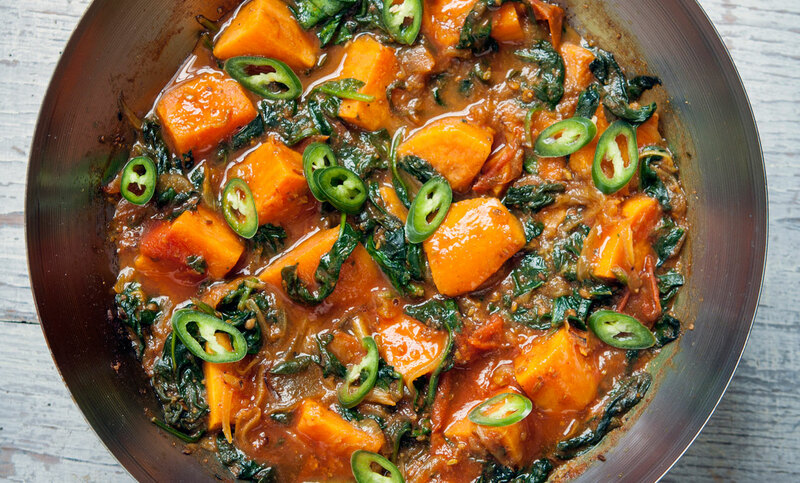 Cover and cook the sauce until the sweet potato has softened. Finally, add the spinach and cover again until it wilts. Stir carefully to combine, then garnish with coriander! Best served with rice and/or naan bread.